A few simple but effective changes can help parents guide their children to a more healthy and active lifestyle. Today’s parents are increasingly aware of the health risks associated with poor nutrition and low activity levels in children. Doctors, school teachers and other health professionals have been working to educate children and promote healthy lifestyles for families for years. They have made it known that today’s generation is at a much higher risk for such diseases as diabetes, obesity and heart disease than their parents. In spite of these efforts, news reports have shown that children’s eating habits have deteriorated rather than improved in the past ten years. Once again, doctors are warning parents that it is vitally necessary to promote healthy eating habits and active lifestyles in children. Getting a child to eat nutritious food can be challenging, particularly if that child is already used to eating a diet filled with sugary drinks and less-than-nutritious snacks. The following is a list of some ideas that may help incorporate tasty and healthy food into a child’s diet. * Hide it. Many children (and adults!) do not find green vegetables appetising, and yet these are vital to a healthy diet. The good news is that many of these foods can be “hidden” in other foods. Many parents have had luck pureeing vegetables, freezing it in ice cube trays and then throwing in these cubes full of vitamins and nutrition into sauces, soups and chilli. This boosts the nutritional content of food without much change to the taste or texture of the food. * Smoothies are a great-tasting way to pack a lot of nutrition into a relatively small amount of food. A smoothie usually consists of blending together some milk and/or juice, some yogurt, a banana and another fruit and some ice cubes. Other items such as leafy green vegetables, protein powder and fibre can be added to boost nutritional content. * Dips and sauces. Most children love to dip their food. While ketchup is certainly an old standby, many children enjoy other dips such as ranch dressing, sour cream, hummus or yogurt for their crackers, fruits and vegetables. * Whole grains. Whole grains are an important source of fibre, vitamins and minerals and can be found in items like whole grain breads, pastas and cereals. * Water. Studies have shown that many children drink far too much juice and not nearly enough water. Giving a child a measured and limited amount of juice that is allowed to be consumed in a day can be extremely beneficial to their health. Regular exercise is equally as important as healthy food. With temptations such as video games, movies and television with which to fight, parents often feel like they are fighting an uphill battle. 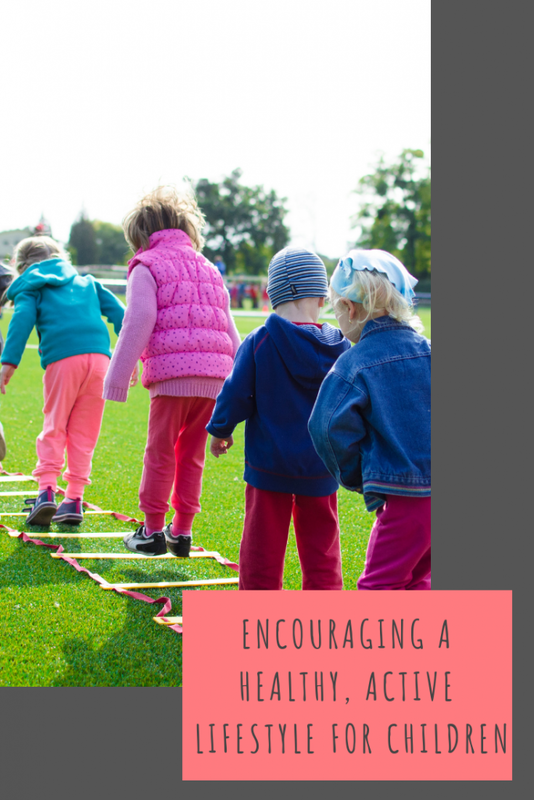 A few simple changes can help a child become more active in their day to day life. * Walk. Walking is one of the simplest forms of exercise and can be incorporated into daily living in small but effective ways. Parking a little further from an entrance, taking stairs instead of a lift, walking to the corner shop or to school are all ways in which exercise can easily be added to a routine. * Bike riding. Most children truly enjoy bike riding. Riding a bicycle can become transportation for children to and from school or just a form of recreation and fun. * Extracurricular. Most communities have a vast variety of activities and sports for children. From dancing, football, swimming and gymnastics to family yoga and martial arts, there is something for everybody. * Limited screen time. Studies have shown that most children claim to get more time in front of televisions and computers than their parents are saying. Whether or not this is true, it is important to be aware of the amount of time that a child spends in front of a screen. Many parents feel as though they are fighting a losing battle when it comes to encouraging healthy lifestyles in their children. With some relatively simple changes, parents can heed the warnings of the medical community and help today’s children achieve a healthy life. I have always been really lucky with my older two in that they will eat anything so it was easy to give them a healthy balanced diet without any complaint, then I had my toddler and he is completely the opposite. Hiding veg in sauces, dips and the like is the only way I can get him to eat properly! I think that many parents get discouraged when children won’t eat healthily. Disguising foods and adding healthy ingredients that are not obvious can really help. Great tips here and your right its so important! We try to get the kids involved when it comes to picking healthy food. Things like each week when we do our shop they each choose some fruit they would like to try, it can be as average or as exotic as they want. I find getting kids interesting about clubs such as football club (or my son is part of a swim club) can be a fun way to get exercise in without them really realising as they are having fun with kids their age and learning new skills too! I think my kid eats healthier than I do! He hasn’t discovered the joys of over indulging in bad foods yet so he’s relatively happy with his food at the moment. We also do loads of walking and running outside so I think he manages to get a pretty balanced lifestyle, thank god! I’ve always been quite lucky with my two. They both eat really well, and they both love running around outside so they get plenty of fresh air and exercise. I know a lot of mum’s who aren’t as lucky. I was definitely a nightmare when it came to eating when I was younger!